Then in 2004 my world changed. 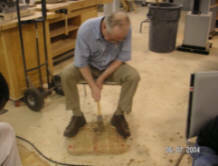 I attended the Sycamore Institute and took a week long course in the construction of a continuous arm Windsor chair. That week was my first taste of the “feel” of things. When one builds flat-work (cabinets and such), the concern is to make “straight” cuts and to make those cuts to an accurate measurement. 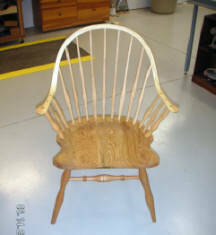 The Windsor chair was constructed by hand and to the measurement of the eye. The size was right, when it “looked right”. The seat was right, when it “felt right”. The height was right when it “sat right”. 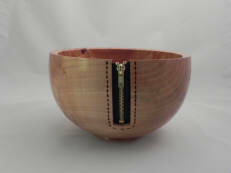 In the course of building the chair, I was reintroduced to the lathe—a tool I had not used since my junior high days.